The 26th annual Cajun and Zydeco Mardi Gras Ball arrives in Cranston Saturday with great food, wide open dancing, and of course, the best music. 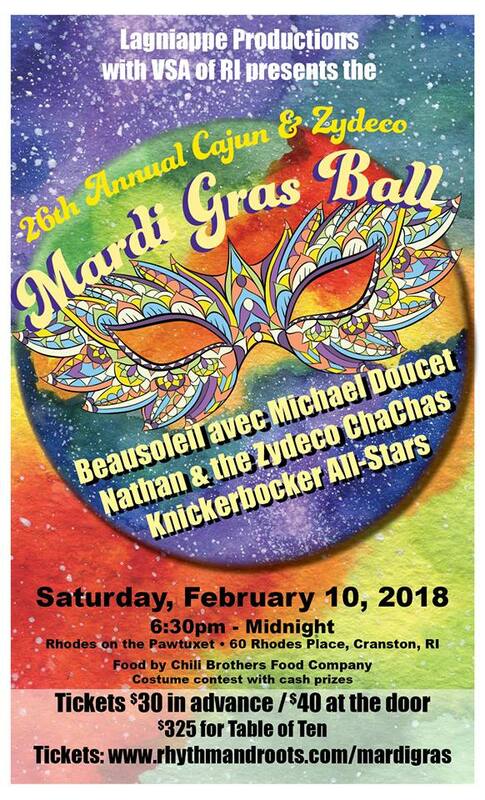 Bands include favorites Beausoleil avec Michael Doucet, Nathan & the Zydeco Cha Chas, and the Knickerbocker All Stars, who will be playing a special set dedicated to Fats Domino. The event is run by Chuck Wentworth, producer of the annual Rhythm and Roots Festival. Details here. Mardi Gras Ball 2018 is switching over from their old twitter account, @MardiGrasBallRI, to a new one, @MardiGras_RI. We would appreciate shares, retweets and follows. Lagniappe Productions, creators of the annual Labor Day weekend Rhythm & Roots Festival in Charlestown, R.I., are bringing their well-loved brand of great music, food, dancing and fun to the 26th annual Louisiana Mardi Gras celebration. Southern New England’s popular Mardi Gras Ball is set for 6:30 p.m. to midnight, Saturday, Feb. 10, at Rhodes on the Pawtuxet in Cranston, R.I. Doors open at 6 p.m. in anticipation of Grammy-winning Cajun band Beausoleil avec Michael Doucet, international performers Nathan & the Zydeco Cha Chas, and New Orleans blues from Rhode Island’s own Knickerbocker All-Stars. Cajun and Creole cuisine is offered by the renowned Chili Brothers Food Company – arguably the most popular food vendor at the Rhythm & Roots Festival every year, serving up their world-famous, Louisiana-inspired cuisine. The ball also features a costume contest with cash prizes in a variety of categories including best group, best couple, best individual and a grand prize of $250 for best overall costume. Tickets are $30 in advance or $40 at the door. Reserve a table for 10 (in advance only) for $325. Tables sell out fast. 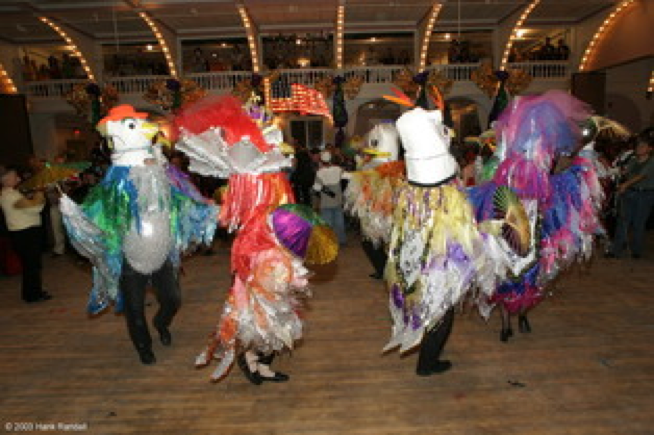 Tickets may be purchased at http://www.rhythmandroots.com/mardi-gras-ball or by calling 401.783.3926. Lodging is available at the Rodeway Inn, 1940 Post Road, Warwick. Rooms are $79 per night. Call 401.732.0470 and ask for the Mardi Gras rate. The event will benefit VSA Arts RI, the nonprofit organization that opens the world of art to children and adults with disabilities. Lafayette, LA-based Beausoleil avec Michael Doucet has been one of the most esteemed Cajun groups in music since forming in 1975. BeauSoleil avec Michael Doucet take the rich Cajun traditions of Louisiana and artfully blend elements of zydeco, New Orleans jazz, Tex-Mex, country, blues and more. From The Grand Ole Opry to Newport Folk, from concert hall to dance floor, the music of BeauSoleil captivates audiences the world over. Michael Doucet sings and plays violin, guitar, accordion and mandolin. Accordion master Nathan Williams, of Nathan and the Zydeco Cha Chas, was mentored by one of the greats, Buckwheat Zydeco. He has been inducted into the Louisiana Music Hall of Fame and has been honored with the Zydeco Music Association’s Lifetime Achievement Award. Formed in 1985, the band has brought its unique take on regional South Louisiana music around the world. Dennis Paul Williams, Nathan’s brother, brings his jazz-influenced guitar to the band. The Knickerbocker All-Stars is made up of legends of the blues community who have found their home at the Knickerbocker, the historic venue in Westerly, R.I., that gave rise to Roomful of Blues, which launched the blues revival in the 1970s. Musicians in the All-Stars have included Jimmie Vaughan, Duke Robillard, Al Copley, Monster Mike Welch, Ricky Russell, Willie J Laws, Brian Templeton, Sugaray Rayford, Rich Lataille and more. For the Mardi Gras Ball, The All-Stars will be showcasing a set of New Orleans music classics with a special tribute to recently passed Fats Domino. Join Mardi Gras Ball/Rhythm & Roots E-mail List! Tickets are $30 in advance or $40 at the door. Reserve a table for 10 (in advance only) for $325. Tables sell out fast. Tickets may be purchased at here: http://bit.ly/26thMardiGrasBall or by calling 401.783.3926. Lafayette, La.-based Beausoleil avec Michael Doucet has been one of the most esteemed Cajun groups in music since forming in 1975. BeauSoleil avec Michael Doucet take the rich Cajun traditions of Louisiana and artfully blend elements of zydeco, New Orleans jazz, Tex-Mex, country, blues and more. From The Grand Ole Opry to Newport Folk, from concert hall to dance floor, the music of BeauSoleil captivates audiences the world over. Michael Doucet sings and plays violin, guitar, accordion and mandolin. Online ticket sales will end at 5:00pm on Friday, February 24th at www.rhythmandroots.com . Tickets are $30 in advance, $40 at the door and a limited number of reserved tables of ten are still available for $325. Cajun and Creole food will be for sale from the beloved Chili Brothers and the bars will be serving when the doors open at 6:00pm. This is a costume optional Ball with prizes awarded to the winning singles, couples and groups. Lodging is still available at the Comfort Inn, 1940 Post Road in Warwick RI for $79 per room per night. Call today and ask for the Mardi Gras rate at 401-732-0470. See y’all on Saturday night! Lagniappe Productions, producers of the annual Labor Day weekend Rhythm & Roots Festival in Charlestown, RI, bring back their authentic Louisiana Mardi Gras celebration held annually in southern New England. The Cajun & Zydeco Mardi Gras Ball returns for its 25th year at Rhodes on the Pawtuxet on Saturday, February 25, 2017 from 6:30 pm to midnight. Featured bands include Steve Riley and the Mamou Playboys, Roddie Romero and the Hub City All Stars, and Corey Ledet and His Zydeco Band. Rooms are $79 per night. Ask for the Mardi Gras rate. The ball features a costume contest with cash prizes in a variety of categories including best group, best couple, best individual and a Grand Prize of $250 for best overall costume. There will be a cash bar and Cajun & Creole cuisine by Rhode Island’s renowned Chili Brothers Food Company – arguably the most popular food vendor at the Rhythm & Roots Festival every year, serving up their world-famous, Louisiana-Inspired Cuisine. Steve Riley and his Mamou Playboys returns to the Mardi Gras Ball by popular demand to make sweet Cajun music together. For 25 years they have played great Cajun music steeped in the French heritage of southwestern Louisiana and driven by accordion and fiddle. Matching their uncompromising respect for tradition with forward-looking vision Steve Riley and the Mamou Playboys have set the standard for modern Cajun music. Their musicianship, songwriting skills, harmony vocals and irresistible grooves mark them as one of the best bands to come out of South Louisiana. Roddie Romero & the Hub City All Stars are nominated for 2 Grammy Awards in 2017. They have been performing worldwide at the most prestigious festivals and venues for over 20 years. This premier Louisiana band is celebrated not only for their authenticity when performing or recording traditional Cajun and Creole music indigenous to South Louisiana, but also for their original songwriting which stays true to Louisiana inspirations. They are notorious “Louisiana-Roots-Rockers” who put on an energetic show which is bound to make everyone get up and dance! Grammy- nominated Corey Ledet is a brilliant young accordion player who has learned his craft from studying the Creole Masters like Clifton Chenier, John Delafose, Boozoo Chavis and others. Corey has fused the styles of these masters into creating his own unique style of contemporary Creole & Zydeco music which enables him to please any audience. Backed by a full band, Corey remains true to his roots and earnestly searches for ways to include them in his music. He keeps one foot firmly in the tradition while exploring surrounding influences in order to create the best of both worlds, and is able to infuse old and new styles of Zydeco into his own unique sound. The Hot Tamale Brass Band takes their audience on an exciting excursion into New Orleans jazz, festive Mardi Gras, funky second line parades, traditional Dixieland jazz and reverent New Orleans jazz funeral traditions. The Hot Tamales jam at local Boston MA clubs, perform as a Mardi Gras band at theme parties and as a second line brass band for all types of parades. The Hot Tamale Brass Band plays Dixieland for people of all ages! The Hot Tamale Brass Band takes their audience on an exciting excursion into New Orleans jazz, festive Mardi Gras, funky second line parades, traditional Dixieland jazz and reverent New Orleans jazz funeral traditions.